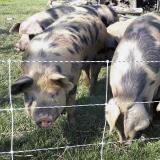 100 ft roll of 30" Pig QuikFence® single spike electric netting creates a 25' x 25' enclosure. 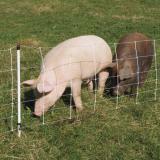 Pig QuikFence® 6/30/12 is a 30" electrifiable prefabricated fence. It arrives at your door as a complete roll with the single spike posts already built into the mesh/fence. 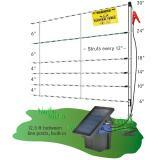 Features 6 electrified horizontals strands with vertical struts placed every 12". Add 3 more rolls (Item #208062) to create a 100' x 100' enclosure. The product seems great but it’s all way to expensive by the time it got to me. Shipping, duty, and just the price in Ferber all is way way too expensive! I hope one day you figure out a Canadian distributor because I will probably never buy this product again due to the extremely high cost. Was quick and easy to set up, and good quality. Great product. First time buyer. Bought based on reviews of previous customers. I wasn't disappointed. Quick service and turn around time. Easy set up as well. 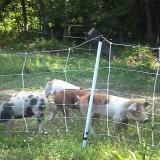 Pigs were curious and got shocked no more trouble. Now I'm able to move them around with ease and without worry of escape. 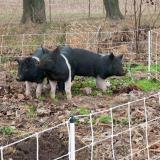 This fencing is perfect for my potbelled pigs. They tested it only once, got the idea and have not gone near it since. I also love how easy it is to take down when I mow and easy to go right back up. 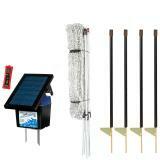 The solar energizer is ideal as it is just far enough from the barn not to worry about power cords. 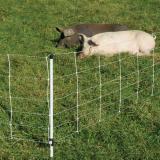 This fencing truly makes my life on the farm a bit easier.